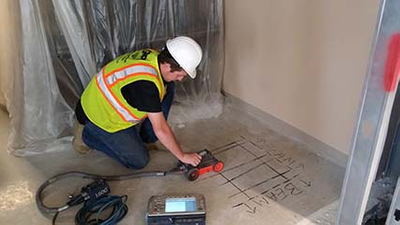 GPRS was recently called out to a university in Knoxville, Tennessee to scan a concrete slab to locate beams, reinforcing steel, and conduits so the contractor would not hit them when coring for their fire protection lines. Digital concrete imaging is a quick and easy way to locate post tension cables, rebar, and conduits in concrete prior to saw cutting or core drilling. The process is extremely fast due to its live feed system, which means the targets are mapped out on the surface of the concrete as they are located in real time. Concrete radar also does not emit any radiation like traditional x-ray so data can be collected on an active job site without causing any harm. For concrete scanning in Knoxville, Chattanooga, or Tri-Cities, please call Mitch White at (865) 206-7639 or email mitch.white@gprsinc.com.